Suicide is a complex human behavior with multiple interacting determinants. 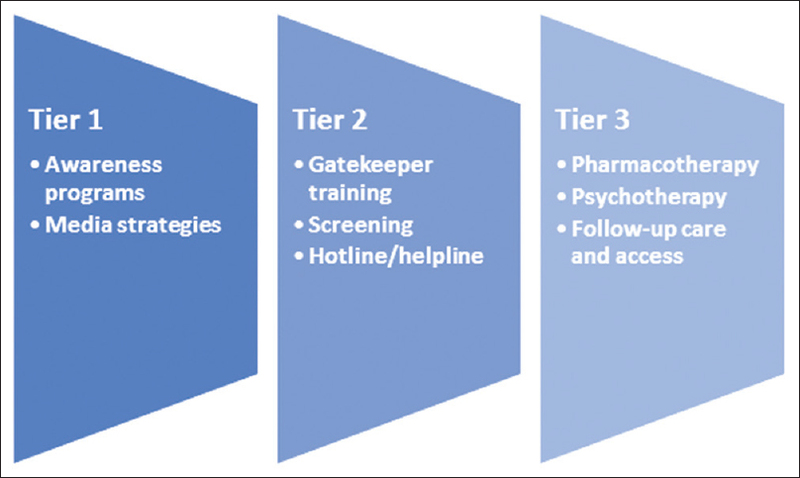 Clinicians and practitioners often face difficulties in assimilating the evidence base for suicide prevention interventions, evaluating their effectiveness and decoding the best practice elements of each approach. In this article, we do not aim to provide an exhaustive coverage of every approach. Instead, we provide an overview of the following eight major suicide prevention interventions: awareness programs, screening, gatekeeper training, access to means restriction, follow-up care, hotlines, media strategies, pharmacotherapeutic and psychotherapeutic approaches. The evidence base and components of each approach are described to facilitate replication. The best practice elements are synthesized from each approach and presented to aid program development and practice. Although a number of approaches hold promise, there are difficulties in ascertaining the effective elements under each of them. Innovative research designs are needed to address this knowledge gap as it will facilitate optimal allocation of resources for suicide prevention. Background: Healthcare-seeking behavior is associated with the severity of infectious diseases, particularly in low-income countries. We need better understanding about the current healthcare-seeking behavior of rural people in low-resource settings. This study aimed to describe the healthcare-seeking behavior of rural people for infectious diseases and identify the associated factors. Methods: We conducted a cross-sectional survey in a rural community in Bangladesh. We interviewed a total of 450 persons to collect data on demographics, household income, household expenditure, and healthcare-seeking behavior. We performed a descriptive analysis to summarize the demographic characteristics and multivariate logistic regression analysis to identify the association between healthcare-seeking behavior and variables of interest. Results: Among the study participants, 42% went to the health facilities, 30% went to the pharmacy, 14% went to the nonregistered doctors, 1% went to the traditional healers, 1% went to the spiritual healer, and 2% took self-treatment. Proximity of the health-care facilities (prevalence ratio [PR] 1.97, 95% confidence interval [CI]: 1.55–2.49) and number of clinical symptoms (PR 1.23, 95% CI: 1–1.52) were significantly associated with the care-seeking behavior. Conclusions: Healthcare-seeking behavior for infectious diseases among rural people in Bangladesh was poor. Information obtained from this study could be useful to develop, design, and improve health-care systems in low-resource settings. Introduction: Lassa fever (LF) is an endemic West African viral hemorrhagic fever which presents acutely and is often fatal. 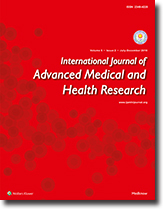 This study assessed the level of knowledge about LF among the health workers in Sokoto State and also examined their cross-infection control practices against LF during ongoing outbreaks in health facilities in Nigeria. Methods: Data obtained from a total of 298 health workers in five hospitals in Sokoto metropolis, Nigeria, were used for this study. The study tool was a 25-item questionnaire. Data obtained were analyzed using the SPSS version 20 Software. Results: Three-tenth of the participants were within the age bracket of 26–30 years. About 54% were men, 54.4% were nursing officers, and 75.2% of the participants had practice ≤10 years. All of the surveyed medical doctors and dentists were aware of the ongoing LF outbreak in Nigeria. All of the dentists and medical laboratory scientists surveyed accurately identified the virus as the cause of LF. Only the dentists accurately identified Mastomys natalensis rodents as the vector for LF, and its transmission from person-person. Less than 20% of the participants in each occupational category did not know the universal precaution measures against infections, and about 12% of the respondents wore their personal protective equipment outside the surroundings of their duty posts. It was observed that more than 50% of the participants were below 60% on a scale of 1%–100% regarding their cross-infection and control practices. Conclusion: The findings obtained from this study revealed a very low level of knowledge about LF and very poor universal cross-infection control practices against LF among the health workers in Sokoto City, Nigeria. Introduction: Information on incidence of various transfusion reactions could help in early recognition as well as management and could also help to institute adequate measures to make blood transfusion as safe as possible. The primary objective of the present study was to determine the frequency and types of adverse transfusion reactions in patients who required blood component transfusion. Methodology: This was a cross-sectional, observational study conducted over a period of 22 months from September 2014 to June 2016 in the Department of Transfusion Medicine, JIPMER. All patients admitted to the wards of various specialty departments who were transfused with blood components and reported to have transfusion reaction during or after transfusion of blood components were included in the study. Results: A total of 90,758 components were issued during the study period, and 137 transfusion reactions were reported which accounted for 0.15% of total transfusions. Febrile nonhemolytic transfusion reaction (46.7%) was the most common reaction followed by allergic reaction (31.3%). Among different blood components, packed red blood cells (82%) were most commonly associated with transfusion reactions. Conclusion: Transfusion reactions unless serious are grossly underreported either due to lack of attributing the adverse event to transfusion or because the milder reactions are usually managed and unreported as the staff are too often used to having them, especially in chronically transfused patients. Human immunodeficiency virus-1 (HIV-1)/acquired immunodeficiency syndrome (AIDS) has been shown to be associated with a constellation of neuropsychiatric disorders. The presence of depressive symptoms may obscure the evaluation of cognitive manifestation of a neurodegenerative disorder like dementia associated with AIDS. Further, it is uncommon to see catatonia in association with HIV/AIDS. In this report, we present a case who had an array of psychiatric syndromes as the initial manifestation of AIDS. The subsequent management issues are also dealt with. Dyskeratosis congenita (DC) is a rare heritable skin disorder with progressive bone marrow failure. Psychiatric manifestations could also be a presentation of this rare skin condition. Although it has been associated with psychiatric manifestations, there is a dearth of information regarding mood symptoms in this condition. 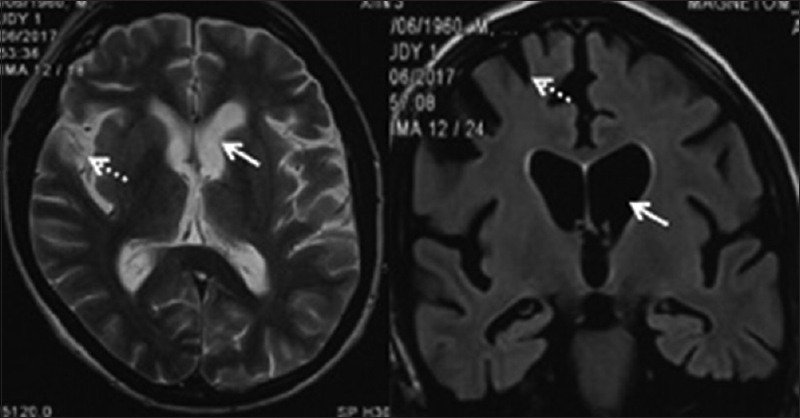 We report a 41-year-old male who had presented with predominant psychotic followed by affective symptoms and was diagnosed with DC and comorbid organic delusional and mood disorder. He was also worked up for other physical manifestations of DC. Pasteurella multocida (PM) is part of the normal nasopharyngeal flora of many animals. The most common PM infections occur in soft tissue, secondary to animal contact. Meningitis is rarely associated. 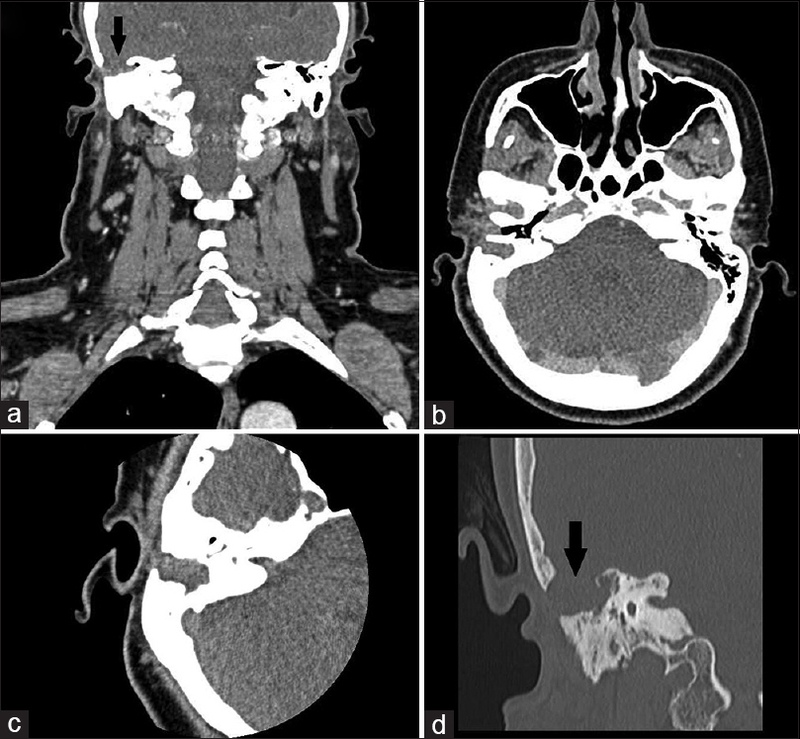 An adult female developed chronic right-sided otorrhea and tympanic membrane perforation. Elective mastoidectomy was performed. On the postoperative day 2, the patient experienced a decreased level of consciousness, headache, nausea, and seizures. Cerebrospinal fluid (CSF) analysis revealed low glucose, high protein, and high cellularity. Blood tests were within normal limits, except for high leukocyte count. Two days after the neurological manifestations, bacteria, identified as PM, grew in the aerobic cultures of CSF and preoperative ear swab. The isolate was sensitive to penicillins. She was started on intravenous penicillin G. The patient had a full recovery. On further questioning, she admitted having a dog, which licks on her face frequently.